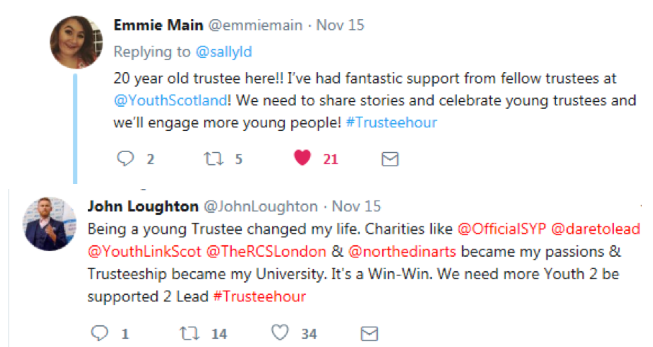 For those of you who have been following #trusteehour on twitter, you’ll know that Miles Weaver and I are pretty motivated by supporting others to take on a charity trustee role with confidence. We’re both involved in a range of projects connected with this end in mind. For others, it may feel like too much too soon. At the ‘Unconference’ session during the Trustees’ Week 2017 event in Edinburgh, I facilitated a workshop group exploring ideas around how to encourage a pipeline of new (and younger) trustees. The concept of an apprenticeship was discussed. A charity would however need to have time and resources to support the creation of this kind of temporary role. For busy and stretched charities, this might not always be easy. Since the Unconference session, we’ve been thinking about how to help fill this gap. After some discussions with umbrella groups to test the concept, we’re now ready to rollout Committee Pathways. For those following the competency pathway for trustees in use at Edinburgh Napier University, a committee role would be one way to gain some governance-related experience. At the same time, a committee role might be exactly the right ‘fit’ for someone of any age happy to share their expertise with a charity in a non-trustee role, finding that the time commitment better reflects what they’re able to take on. Now, to turn to the supply side. Does your charity’s governing document allow non-trustees to be co-opted onto committees? Could your charity do with a few extra pairs of hands on one or more of your committees? If the answers are ‘yes’, then we can help to publicise your vacancies. If your charity is on twitter, tweet about your vacancy, with a role profile and closing date. Use the handle @Pathways_C and we’ll spot and share your vacancy online. If you’re not on twitter, could someone else help to post your vacancy online? The second half of 2018 will be a pilot to gauge how this approach might help to support attracting new entrants into future trustee roles. It’s entirely possible that a committee role could later lead to a board role opportunity. Taking on a committee role enables someone to get to know a charity, find out more about how it operates ‘on the inside’ and get to know others involved in running the charity. It could be a positive volunteering experience in itself and a great confidence-builder and pathway towards a future trustee role. The supply and demand side both need to emerge for Committee Pathways to have impact. Time will tell. We’re offering this as a pilot for the second half of the year, and we’ll see how it goes. It’s the theme for July’s #trusteehour on Thursday 19th July 8-9pm – join the conversation online @trusteehour to explore more. Guest blog by @2050ClimateGrp: After #YoYP #TrusteeHour, how can we increase youth participation in board governance?